It’s been a while since I’ve been for a meal in Bristol using a voucher from one of the daily deals sites. A few months ago, a friend of mine bought a LivingSocial voucher entitling us to two courses and a glass of bubbly at the Bristol branch of Jacks Brasserie (they also have a site in Portishead). We’ve had a few enjoyable meals and invites to new menu preview evenings at the restaurant in the past, so we were quite excited to be heading back to try their most recent menu. Situated on the Harbourside, Jacks offers a contemporary British menu from head chef Simon Davis at very reasonable prices. Dishes are influenced by British classics, and he and his team aim to use South West produce wherever possible. Facing out onto the water, it’s a fairly small venue, with an informal seating area to the left, in front of the kitchen, and the main dining area to the right of the bar. There’s a terrace outside the front, which is great when the weather’s good! We’ve previously been in for a great Sunday lunch…and our choice of starters on this particular occasion was based on that meal in particular. 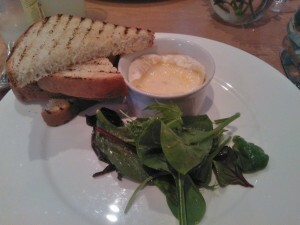 We were both happy to see a garlic and thyme baked Cornish Camembert on the menu (£6.95), which we’d loved on our previous visit. The portion size was smaller than on our previous visit – which is a good thing…it was a little overwhelming before! Each of us received a whole mini cheese, baked in individual pots, alongside a perfectly-sized serving of a sweet and sticky red onion marmalade. The cheese itself had been melted to the point where a spoon would have been useful to scoop it out of the pot, but we made do with our knives and forks. The slight sweetness of the brioche was a great partner for the cheese, but there was a lot of it – the slices were very thick! It would also have been good if it had been a little more well-toasted, commented my dining companion – scooping melting cheese onto slices of a soft loaf proved somewhat tricky. My friend is a bit of a steak fiend, and so ordered the onglet of West Country beef (£14.95), recommended to be served rare and happily ordered by her to be cooked that way. 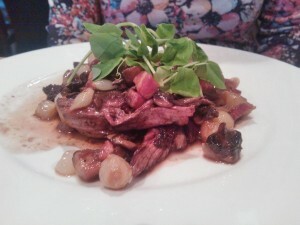 Although not one of her favourite cuts of beef, it was perfectly cooked, and served with a generous, if fairly wintry, accompaniment of baby onions, large chunks of bacon, mushrooms and a red wine sauce. The hand cut chips that came with the dish were served in a separate bowl, meaning that they remained perfectly crisp and crunchy on the outside and fluffy in the middle – they were amazing! Trying to avoid ordering the same things wherever I go, I ordered the Brixham plaice (£ market prices). 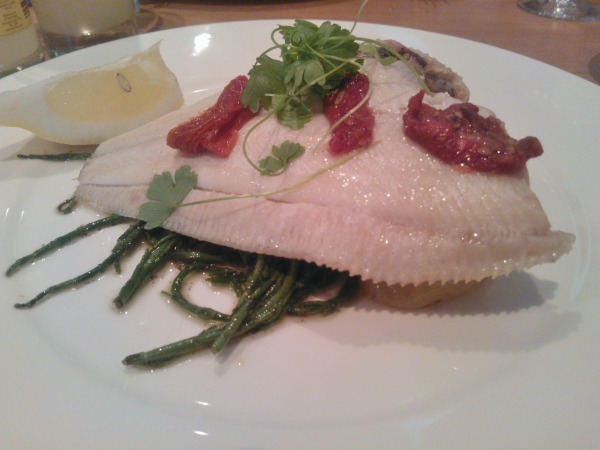 The fish was perfectly cooked, and sat on a bed of lovely, buttery samphire. A portion of Cornish new potatoes (a little overcooked) and a handful of confit tomatoes finished the plate – a nice, simple dish that was a lot more light and summery than some of the options on the current menu. Too full for dessert, we paid for our additional drinks and…erm…headed to the casino. No big wins on the night, sadly, but a thumbs up for our meal. I’ve now also applied for a Neighbourhood Card, which will entitle me to more, regular offers from Jacks Brasserie…we’ll certainly be back.